Floating candle wedding centerpieces are simple to make, yet they can create a breathtaking scene when lit up on your reception tables. Candles are typically associated with romance, which makes them ideal for wedding decor. The candles provide low lighting and can create a romantic ambiance without costing you much time or money on your centerpieces. Take a few home to utilize in your home decor when the wedding is over to remind you of your special day, or give them to guests after the reception. 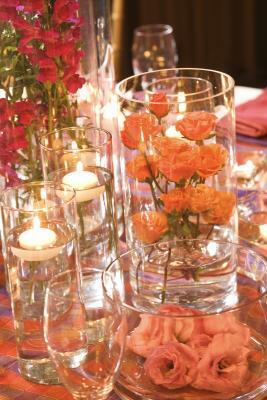 For instructions on how to make floating candle centerpieces for your wedding, read it at ehow.com. This entry was posted in Centerpieces and Tablescapes, DIY and tagged Accessories, Decor and Design, DIY Wedding Centerpieces, Wedding.